The Walmart Foundation gave $56,000 to UAMS to support the Center for Diversity's summer programs. From left to right: Tony Rause, Walmart distribution area manager; Rhonda Johnson, Walmart vision center manager, Bowman Road; Billy Thomas, M.D., UAMS vice chancellor for diversity and inclusion; Michael Lindsey, Walmart director of public affairs; and Stephen Schafer, UAMS executive director for development for corporations and foundations. 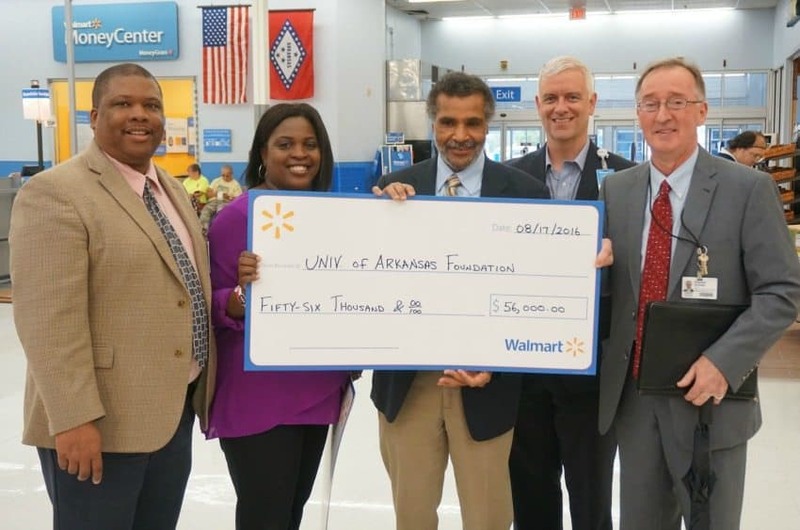 Aug. 17, 2016 | Aug. 17, 2016 | The Walmart Foundation has given $56,000 to the University of Arkansas for Medical Sciences (UAMS) for its Center for Diversity Affairs Programs. The summer enrichment programs encourage students throughout the state to consider careers in health care. The presentation took place Aug. 17 as part of Walmart’s Day of Giving, held annually to recognize organizations whose efforts address local needs and improve the state of Arkansas. Michael Lindsey, Walmart director of public affairs, praised the Center for Diversity Affairs for its efforts both at UAMS and in reaching young people across the state. The Center for Diversity Affairs summer enrichment programs are designed to strengthen science, math, literacy and test-taking skills. In addition, the programs give students an introduction to the many health career options at UAMS and include mentored research, the Summer Science Discovery Program, Bridging the Gap, ACT Preparation, and Undergraduate Summer Science Enrichment Program I and II. This summer, more than 180 students were exposed to health careers in the UAMS colleges of Health Professions, Medicine, Nursing, Pharmacy, Public Health and the Graduate School. The Walmart Foundation supports initiatives focused on creating career opportunities and strengthening communities, in an effort to enable sustainable impact. The foundation meets the needs of the underserved by directing charitable giving toward its core areas of opportunity, sustainability and community.